Dark Sun’s unique flavor extends to equipment. From the materials used to the differences in construction to paying with clay pieces (cp), Athas is very different when it comes to weapons. Athasian weapons are shaped by the materials available and the difficulty with which to find skilled craftsmen. Metal weapons are extremely rare. Expert gladiators might spend their whole lives without so much as a rusty dagger. Weapons are crude and lashed together from materials scavenged from the desert. Knowledge of weaponsmithing is lost, replaced by ingenuity borne from the gladiatorial arenas of the city-states or the slave tribes and raiders of the wastes. While the full rules have not been released, we do know that most weapons will be of materials other than metal. Previous editions had penalties associated with the material – bone, wood, stone, obsidian, and even other scavenged materials were used and incurred penalties to attack, damage, or other aspects. Reckless Breakage: When you roll a natural 1 on an attack roll, your weapon has a chance to break. You can accept the result, automatically missing the attack as usual, but keeping your weapon intact. Alternatively, you can reroll. Regardless of the reroll result, a nonmetal weapon breaks once the attack is complete. A metal weapon breaks only if you roll a natural 5 or lower on the reroll. This rule gives you a say in whether a weapon breaks. You can play it safe and accept the errant attack, or you can attempt to avoid a miss by risking your weapon. Designers have said that other rules exist, but that they are optional and given so DMs can choose the right mix for their game. 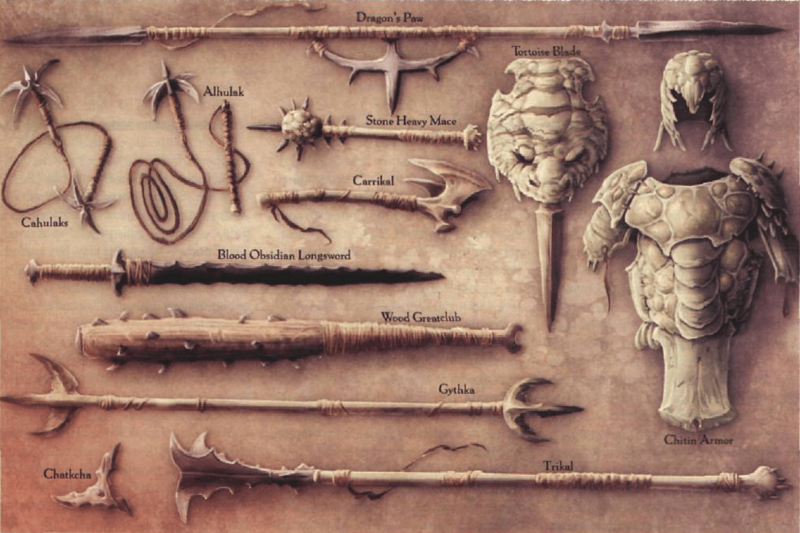 Regardless, players and DMs should both keep in mind the nature of the materials used in Athasian weapons. A metal weapon is likely rusty, maybe bent and chipped. A stone weapon is heavy and unbalanced. An obsidian blade chips when it hits armor or another weapon. Wood cracks and is easily broken by another weapon. Bone can crack and chip and is brittle with age. These are fun aspects to role-play. Edit: See the new handout at the end of this article! In reality, weapons vary across regions. Some city-states favor certain weapons in their militia or gladiatorial arenas. A single gladiatorial champion may popularize a weapon, or a sorcerer-queen may decide that resources or an upcoming battle dictate the militia utilize a certain weapon. Tribes in the wastes may be particularly adept at constructing certain weapons. Why does your PC wield their choice in weapon? Are they emulating a gladiatorial hero? Following cultural convention? Lucky enough to pick it up from a tribe known for crafting them? The various sourcebooks (first boxed set, second boxed set, Gladiator’s Handbook, Dragon Magazine 319) each describe weapons. Interestingly, only the later two provide pictures. What is truly common is up to each DM, though the game likely plays best if all weapons can be accessible, with some favored in certain areas. As you can see above, the weapons and armor look rough and speak to specific fighting techniques. An Alhulak is used to swing wildly, to trip, and to block. The Tortoise Blade combines a shield and blade. The carrikal is a popular double-bladed axe. The Trikal compensates for the heavy blades with a weighted ball at the other end. 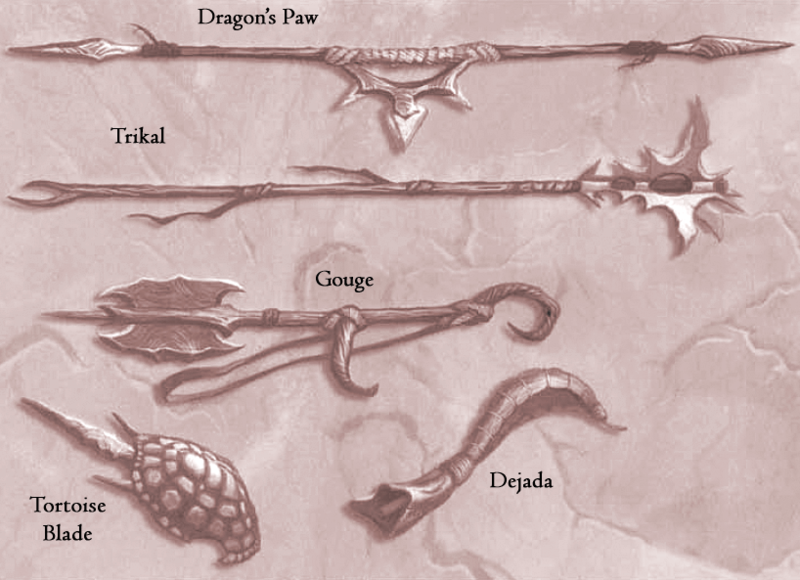 The Dragon’s Paw is a fearsome weapon made famous in the arenas of Tyr and Urik. The weapon’s two ends provide flexibility in choosing how to attack while the central blade protects the hand and serves as a weapon up close. The image above shows the Gouge, brought to popularity by the army of Nibenay. The strap goes over the shoulder, with the two handles being used to gain leverage to swing the sharp blade into opponents. The Dejada fits over the hand and is a cesta – a small basket used to whip a ball (pelota) at great speed towards an opponent. The pelota varies greatly and can be spiked, made of brambles, etc. The Puchik is a punching dagger and the most common type of dagger used for fighting. Forearm axes and Talids provide alternatives to a wielded dagger. The double-headed spear and Lotulis provide reach and are vicious weapons in combat – the Lotulis is especially useful against multiple opponents or to ward off attackers. Singing Sticks do little damage, but the light semi-hollow wooden rods are quick – and make a distinctive whistling sound as they move and strike. 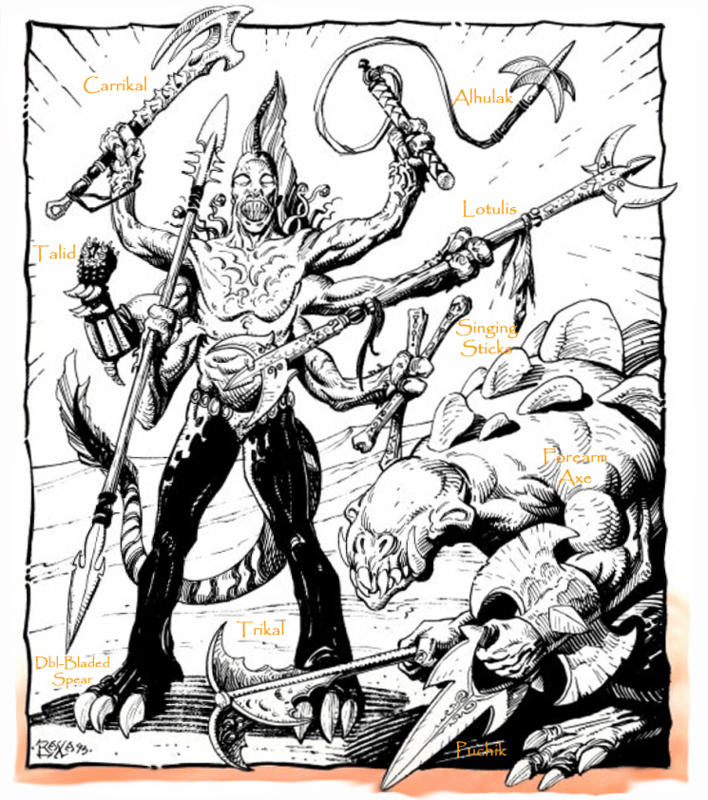 Three of the pregenerated PCs in D&D Encounters’ Dark Sun season use weapons specific to the Dark Sun setting. Each is detailed fully below, based on the information in the revised boxed set. Carrikal: By lashing a length of mekillot bone to the jawbone of any sharp-toothed creature, a kind of battle axe is created. Sharp ridges of teeth run down half the length of the bone handle, and the hinges of the jaw are sharpened to a keen edge. This gives the weapon two deadly axe heads oriented in the same direction. A leather thong connected to the bottom of the bone shaft ensures it remains with its wielder. Trikal: This small polearm is a 6-foot-long, mostly wood shaft. The uppermost 12 inches consist of three blades projecting from a central shaft. Beneath the blades is a series of serrations, generally extremely sharp. The other end of the shaft is weighted to increase the momentum of the weapon. (This seems to be a reach weapon based on his statistics). Alhulak: This weapon consists of a 5-foot length of rope with a four-bladed grappling hook on one end. The other end is secured to a 2-foot-long handle, which can be used to block attacks. The bladed head is commonly carved from mekillot bone, while the handle is wood or bone. In addition, you could choose to RP that some of the other PCs have weapons particular to Athas. A puchik is an easy substitute. You can RP punching creatures with the dagger. A tough one, but the ends could be flecked in obsidian. Singing Sticks could work, perhaps making the singing noise as they are wielded or when casting. A Lotulis, Double-Bladed Spear, or even a Dragon’s Paw could work. The Lotulis could be part of some of her defensive moves, such as her Mantle of Clarity. For Players, enjoy the concept of the weapon you wield. See if you can role-play the weapon’s characteristics and materials as you hit or miss. What sound does it make? Did it come close to breaking? Do you wish you had another foe’s or PC’s weapon instead? For DMs, RP the way the weapons and armor interact. Also, consider having some of the weapons found on bodies be an Athasian substitute. For D&D Encounters, give them the same stats as a current weapon the PC wields – this is simpler and more fun given the game’s format. If you want, consider a bonus if the player does something that might be easier with that weapon, such as a grab, as an alternative to a Twitter buff or as a prize for great RP. If you want to have a handout to show players the common weapons, I have included the three images found above in a single pdf file, Athasian Weapons Images , (please print double-sided to keep our world from looking like Athas…). 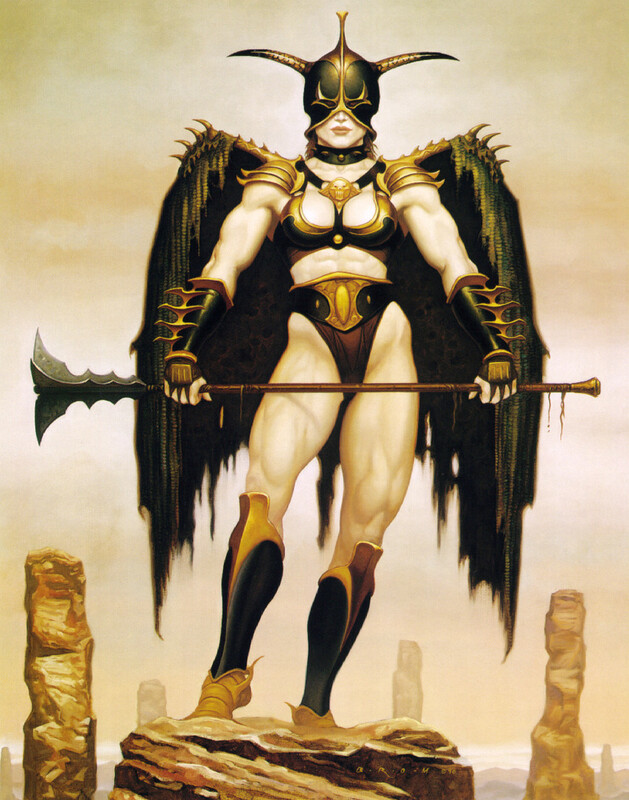 A bit of a departure, as we move away momentarily from lore and instead tackle some tips on DMing various aspects of Dark Sun. We will explore some ideas on making your combats, skill challenges, and role-playing feel Athasian. Edit: Our D&D Encounters DMs group created a two-page weapons handout as well. Weapons Used in Dark Sun Encounters provides images and PC-specific information. When a weapon breaks v2 provides ideas on substitutes that can be found if the PCs break a weapon. Printing them back-to-back makes a very useful handout for each table. This entry was posted on October 2, 2015 by Alphastream and tagged 4E, Crown of Sorrow, Gear, Setting, World-building.